Average insurance rates for a 2015 Ford F-150 are $1,280 a year with full coverage. Comprehensive costs approximately $274 each year, collision costs $418, and liability coverage costs around $430. Buying a liability-only policy costs as low as $486 a year, with high-risk insurance costing around $2,750. Teenage drivers receive the highest rates at $4,830 a year or more. Rate data is compiled from all 50 U.S. states and averaged for all 2015 Ford F-150 models. Rates are based on a 40-year-old male driver, $500 comprehensive and collision deductibles, and a clean driving record. Remaining premium consists of UM/UIM coverage, Medical/PIP, and policy fees. For a middle-aged driver, prices range go from as low as $486 for basic liability insurance to a high rate of $2,750 for a high risk driver. These differences demonstrate why all drivers should compare prices using their specific location and risk profile, rather than using average rates. Searching for better car insurance rates for your Ford F-150? Expensive car insurance can dwindle your checking account and put the squeeze on your family’s finances. Comparing price quotes is a smart way to slash your bill and have more diposable income. If you currently have car insurance, you should be able to reduce your rates substantially using these methods. Buying car insurance is not rocket science. But car owners can benefit from knowing the way companies determine prices and take advantage of how the system works. There are a lot of ways to shop for auto insurance, but some are less time-consuming than others. You could waste time discussing policy coverages with insurance agencies in your area, or you could use the internet to get pricing more quickly. Many insurance companies belong to an insurance system that allows shoppers to submit one quote, and each participating company provides a quote determined by their information. This prevents consumers from doing quote forms to each company. To fill out one form to compare multiple rates now click to open in new window. The only drawback to using this type of system is you can’t choose which carriers to receive prices from. If you prefer to choose specific insurance companies to compare prices, we have a page of low cost auto insurance companies in your area. Click here to view list. It’s your choice how you get your quotes, but ensure you are comparing the exact same deductibles and coverage limits on every quote. If each company quotes mixed coverages you can’t possibly truly determine the lowest rate. Just a small difference in limits may cause a big price difference. And when price shopping your coverage, comparing more company’s prices helps you find better pricing. Properly insuring your vehicles can get expensive, but you can get discounts to help bring down the price. Larger premium reductions will be automatically applied when you get a quote, but lesser-known reductions have to be asked about before you get the savings. Anti-theft Discount – Vehicles equipped with anti-theft or alarm systems are stolen less frequently and earn discounts up to 10%. One Accident Forgiven – Certain companies will forgive one accident before your rates go up as long as you don’t have any claims for a particular time prior to the accident. Safe Drivers – Drivers who don’t get into accidents can pay as much as 50% less on F-150 coverage than drivers with accident claims. Payment Discounts – If you pay your bill all at once instead of monthly or quarterly installments you could save up to 5%. Anti-lock Brake Discount – Cars that have steering control and anti-lock brakes are safer to drive and qualify for as much as a 10% discount. Homeowners Savings – Owning a home may trigger a insurance policy discount due to the fact that maintaining a home shows financial diligence. Life Insurance Discount – Companies who offer life insurance give a break if you buy a life insurance policy as well. Good Students Pay Less – A discount for being a good student can earn a discount of 20% or more. The discount lasts up until you turn 25. Student Driver Training – Require your teen driver to successfully complete driver’s ed class if offered at their school. Keep in mind that most of the big mark downs will not be given to the overall cost of the policy. Most cut the cost of specific coverages such as collision or personal injury protection. Just because it seems like adding up those discounts means a free policy, you’re out of luck. Any amount of discount will cut your premiums. To see a list of companies offering insurance discounts, click here. When it comes to buying the best insurance coverage coverage for your personal vehicles, there really is no single plan that fits everyone. Everyone’s needs are different so your insurance needs to address that. For example, these questions can help discover whether or not you would benefit from an agent’s advice. If my 2015 Ford F-150 is totaled, can I afford another vehicle? Can my teen driver be rated on a liability-only vehicle? Is extra glass coverage worth it? How much liability coverage do I need in my state? Having a good grasp of car insurance can help you determine appropriate coverage at the best deductibles and correct limits. The coverage terms in a policy can be difficult to understand and even agents have difficulty translating policy wording. These are typical coverage types found on the average car insurance policy. This coverage pays to fix your vehicle from damage resulting from a collision with a stationary object or other vehicle. You have to pay a deductible then the remaining damage will be paid by your insurance company. Collision coverage protects against things such as backing into a parked car, colliding with a tree and scraping a guard rail. This coverage can be expensive, so analyze the benefit of dropping coverage from vehicles that are older. Drivers also have the option to raise the deductible in order to get cheaper collision rates. Your UM/UIM coverage protects you and your vehicle’s occupants when the “other guys” do not carry enough liability coverage. 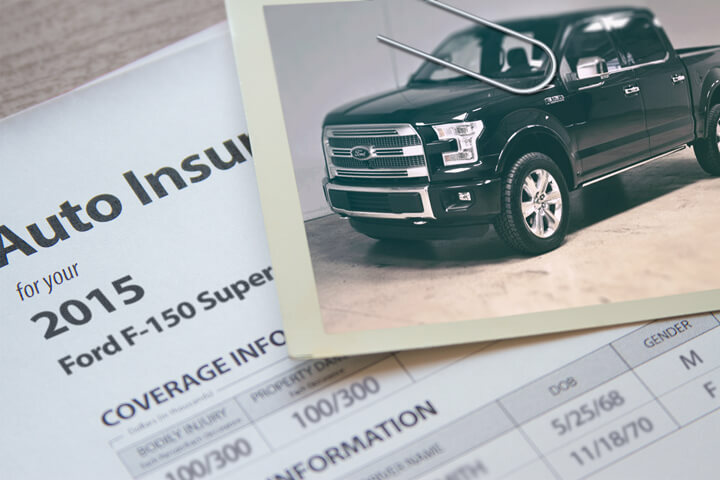 Covered losses include hospital bills for your injuries as well as damage to your Ford F-150. Since many drivers only carry the minimum required liability limits, their limits can quickly be used up. This is the reason having UM/UIM coverage is very important. Most of the time the UM/UIM limits are set the same as your liablity limits. This provides protection from damage or injury you incur to other’s property or people in an accident. It protects you against claims from other people. Liability doesn’t cover damage to your own property or vehicle. It consists of three limits, bodily injury per person, bodily injury per accident and property damage. You might see liability limits of 50/100/50 which means a limit of $50,000 per injured person, a limit of $100,000 in injury protection per accident, and a total limit of $50,000 for damage to vehicles and property. Alternatively, you may have a combined single limit or CSL that pays claims from the same limit with no separate limits for injury or property damage. Liability can pay for claims like loss of income, repair costs for stationary objects, attorney fees and pain and suffering. The amount of liability coverage you purchase is a decision to put some thought into, but buy as large an amount as possible. Comprehensive insurance coverage will pay to fix damage OTHER than collision with another vehicle or object. You first must pay your deductible then the remaining damage will be covered by your comprehensive coverage. Comprehensive can pay for things like theft, rock chips in glass, damage from a tornado or hurricane, a tree branch falling on your vehicle and hail damage. The highest amount you’ll receive from a claim is the cash value of the vehicle, so if it’s not worth much more than your deductible it’s probably time to drop comprehensive insurance.